May 1 is the day to declare it moderately reasonable to begin rash judgments about baseball players and their stats. 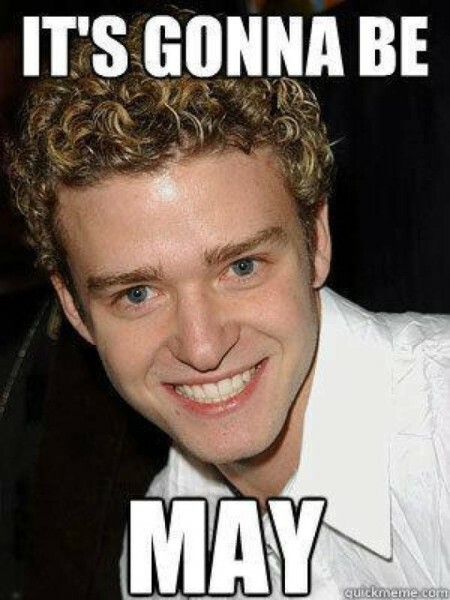 April is over, of course, and Justin Timberlake approves. But it allows us to clump a group of games together and decide whether someone is awesome or not. Because, seriously. 25 games mean something. Okay, maybe it's not all that important. It's just a month. But it's all we have. It's like a small town priding itself in its two gas stations. Yeah, it's just like that. First, let's start with the best Giants minor leaguers at each position through the month of April. Despite an untimely concussion, Andrew Susac has showed in less than a month's time what he can do offensively in the Pacific Coast League. Though he's repeating at Double-A Richmond, and barely improved his SO% and BB% from previous seasons, Angel Villaona has in fact been the organization's best first baseman thus far. April was his third full month with the Flying Squirrels, and he recorded monthly highs in almost all offensive categories. Playing a mix of second base and shortstop, Joe Panik is back to consistently hitting, this year for the Fresno Grizzlies. He has 10 multi-hit games in 27 chances, a batting average just below .300, and no errors in 15 games at second base, his primary position. Bonus stat: Panik is batting .364 with seven RBIs with runners in scoring position. Easily the biggest surprise of the early season is Oregon native Blake Miller. Playing in his hometown of Salem last summer with the Salem-Keizer Volcanoes, Miller received an aggressive promotion to San Jose to begin 2014 and thanks to a current 13-game hit streak, turned his 4-for-29 start into a .312/.360/.532 April. Mitch Delfino has been a force in the heart of San Jose's lineup, hitting for both average and power. The owner of four three-hit games and a four-hit game, Defino has paired well with other middle-of-the-lineup hitters like Mac Williamson, Brian Ragira, and Elliott Blair. Elliott Blair, like his teammate Defino, began the 2014 season on a high note as both players hit their first home runs of the year off Dodgers rehabbing pitcher Josh Beckett. Blair has hit seven extra-base hits since, finishing April with a .509 slugging percentage. It's worth noting that other than his rookie season in the Arizona League, Blair has never finished a season with a slugging percentage above .350. No prospect has raked to begin 2014 like Tyler Graham has. At 30-years-old, Graham isn't necessarily a prospect — at all. But 24 hits and 12 stolen bases in a month is worth noting. He has the highest qualifying average (.364) of any Giants minor leaguer by 31 points — over another center fielder, Jesus Galindo. The only member of the Augusta GreenJackets to make this list is Tyler Horan, who has struck out in 29% of his plate appearances. But the Virginia Tech product is sporting a .442 BABIP, making up for his swing-and-miss downside. Clayton Blackburn has excelled in a month's time in Richmond, being exceedingly the best right-handed starter in the organization to begin the year. Inducing almost two ground balls per inning, Blackburn has utilized the downward movement on most of his pitches to sustain a 1.80 ERA through four April outings. Strangely, Blackburn has been dominant against left-handed hitters, holding them to a .175 opposing batting average in 45 total plate appearances, compared to a .368 mark against the right side. Ty Blach has been the left-handed counter punch to Clayton Blackburn in the Richmond Flying Squirrels starting rotation. Producing just as many ground balls as Blackburn, Blach owns the lowest ERA of a qualifying starter thus far in the Giants system at 1.53. After coming close to making the major league opening day roster, Derek Law reported to Richmond and began dominating. Law racked up six saves in April while posting a 0.87 ERA and a 0.87 WHIP. Steven Okert began the 2014 season as San Jose's set-up man behind sinkerballer Tyler Mizenko, but soon took over the job as closer. With a WHIP below one and an average of 14.2 strikeouts per nine innings, Okert's five saves in five tries have look mighty impressive. Not everybody can play great baseball in April. Here are some of the key struggling players in San Francisco's farm who many expect to succeed. Arroyo's bat is still struggling to come around. He's not striking out, because he makes contact all the time, and sometimes it's pretty hard. But he either finds a defender with a line drive or pounds it into the ground. He has the hit tool to succeed, but he's not squaring up as often as he needs to right now. Arroyo is very young and has all the time to make adjustments, though, so this is merely current observation and not an evaluation. It's just my opinion, so take it for what it's worth, but I feel Arroyo should be at shortstop more often. I like his glove and arm there. It's great to have a guy like Lee keeping watch on prospects in such a distant, far-away land. In regards to Arroyo and his cold bat, I wouldn't worry too much about it. Considering Lee says he's squaring things up and not striking out much (15% of plate appearances), the hits are bound to find his bat soon. Arroyo has played 19 games at second base compared to four at shortstop, for those wondering. Chuckie Jones finished April in a 5-for-28 skid that included just one extra-base hit and nine strikeouts. He actually only has four extra-base hits all season, but at least he's drawing a walk once every seven plate appearances. You never like to see this name when mentioning "struggling players," but sadly, April was not great for the organization's No. 1 prospect. Because he's so hard to hit, the ERA (2.84) looks exceptionally better than the WHIP (1.82) which is inflated due to Crick allowing 14 walks in 12.2 innings. Those walks have spiked his pitch counts, forcing him to be pulled before the fifth inning three out of four starts. The Sacramento native allowed too many base runners in April, and it attributed to his 7.11 ERA in four starts for San Jose. Josh Osich has allowed 10 walks and 12 hits in 10.2 innings of work out of the Richmond Flying Squirrels bullpen. Other lefties Bryce Bandilla and Phil McCormick haven't been much better, either.